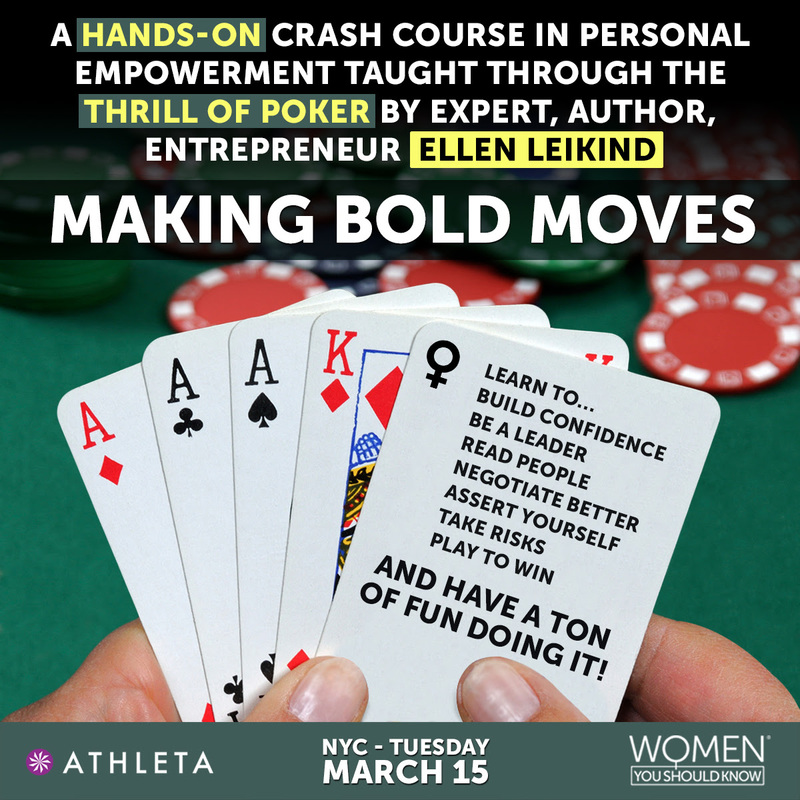 In honor of women’s history month, PokerDivas is excited to be partnering with Women You Should Know (WYSK) and Athleta for this exclusive event! WYSK has extended this special Invitation and offer to our Readers. We hope to see you at the table! If you’re interested in having fun, meeting amazing women, building confidence, gaining invaluable life and business skills, all while learning how to play poker, then join us for Making Bold Moves. This exclusive event centers on an innovative program created and taught by Ellen Leikind, the founder of POKERprimaDIVAS, who has made it her business to help countless women get what they want out of all areas of their lives using the principles of poker. This is not about gambling and requires zero poker experience. It’s about teaching women how to use the skills they’ll acquire at the poker table to empower themselves in their personal and professional lives. ARE YOU READY TO PLAY TO WIN? If you have always wanted to experience a PokerDivas event, now is a great time to get in the game. Seating is limited. POKERprimaDIVAS monthly newsletter and stay up to date on the latest happenings, news, and special deals! To learn more about our Team Building, Client Entertainment, Women’s Leadership or Sales meeting programs. "This is something I would do again and again. It was the best team building we have done. It engaged everyone regardless of their skill level. It’s fun and competitive. A must-do for all teams." "Knowing poker is a necessity to stay competitive professionally. It is a great way to get face time with clients. Similar to golf, it allows women to be at the table with potential clients that were previously off limits." "Poker Divas has become an indispensable tool for our business. Prospective clients and clients alike consider it to be a creative, entertaining way to deal with the emotions of finance." "In poker and life I don’t dwell on my mistakes. Learn from them and realize that the more mistakes you make, the more chances you have to get better." "POKERprimaDIVAS makes it so much fun to learn the game. This is something I can do on a regular basis to get great face-to-face time with my clients." "Forget golf! For women, the new way to the board room is Texas Hold ‘Em. The skills you learn at the poker table–strategy, bluffing, risk evaluation and maintaining that good old poker face–make you a better executive. And did I mention that you’re having fun, too?" © 2019 POKERprimaDIVAS. All Rights Reserved. For education and entertainment purposes only. This is not a gambling website.